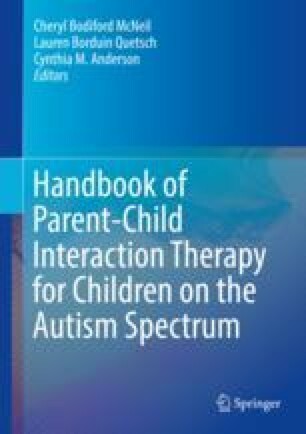 As a clinician delivering Parent–Child Interaction Therapy (PCIT) who works with children with Autism Spectrum Disorder (ASD), you will play some role in assessment of ASD, either peripherally or centrally. This chapter will help orient you to the intake and assessment tasks you will likely encounter, regardless of your role. Questions about ASD that frequently arise during intake are addressed first. Second, surveillance and screening of ASD is reviewed. Third, the components of evidence-based comprehensive diagnostic assessment, including structured and semi-structured parent interviews, collateral reports, objective assessments of core symptoms of ASD, questionnaire assessment of ASD symptoms, cognitive evaluations, assessment of adaptive behavior, and evaluation of language and communication are discussed. Fourth, ongoing assessment and progress monitoring is addressed, including a review of functional behavioral assessment, preference assessment, assessment of problem behavior, and assessment of core symptoms of ASD. Last, we outline ways to help families pre- and post-diagnosis. Robins, D., Fein, D., & Barton, M. (2009). Modified checklist for autism in toddlers, Revised with follow-up (M-CHAT-R/F) [Measurement instrument]. Retrieved from https://www.mchat.org/_references/mchatDOTorg.pdf and https://www.m-chat.org/_references/M-CHATInterview.pdf.